MSD Performance, Inc. (“MSDP” or the “Company”) is a leading manufacturer of performance ignition systems and other performance automotive parts. Headquartered in El Paso, Texas, MSDP’s facilities encompass over 238,000 square feet across six buildings, five of which are located across the U.S. and one in Shanghai, China. The Company mainly serves the motor sports enthusiast and professional racing markets where it maintains leading market share positions across all products categories. Over the years, the Company has expanded its national footprint through organic business growth, as well as from the strategic acquisition of complementary subsidiary companies. The Company now operates through two main subsidiaries, MSD and Powerteq. MSD sells MSD Ignition, Racepak and Atomic branded products including ignition controls, distributors, drag racing data acquisition units and fuel injection systems while Powerteq sells Edge and Superchips branded products which mainly include automotive tuning devices. The Company began a series of acquisitions in 2005 at a time when the dynamics of the market were rapidly changing. Given the growth in competition and pressure from manufacturers to enhance performance, MSDP experienced financial difficulties after an acquisition in 2006. Additionally, the downturn in the economy and the associated effect on the automotive industry led to pressure on the Company’s sales and profitability. In response to the macroeconomic and Company-specific headwinds, MSDP restructured the organization and implemented several strategic initiatives to grow and diversify its revenue base, rationalize its cost structure, reduce its working capital needs, improve margins and maintain profitability. While MSDP was able to maintain healthy margins, the Company had a significant debt burden which constrained liquidity and limited its ability to grow. After considering a number of options for reorganization, MSDP determined that a sale of the Company’s assets would be the best method of maximizing value for its creditors and parties in interest. In order to sell its assets, the Company filed for Chapter 11 protection under the U.S. Bankruptcy Code in the District of Delaware on September 6, 2013. SSG was retained as the Company’s exclusive investment banker for the purpose of marketing the business and soliciting offers. SSG conducted a comprehensive marketing process which resulted in a wide range of potential strategic and financial buyers. 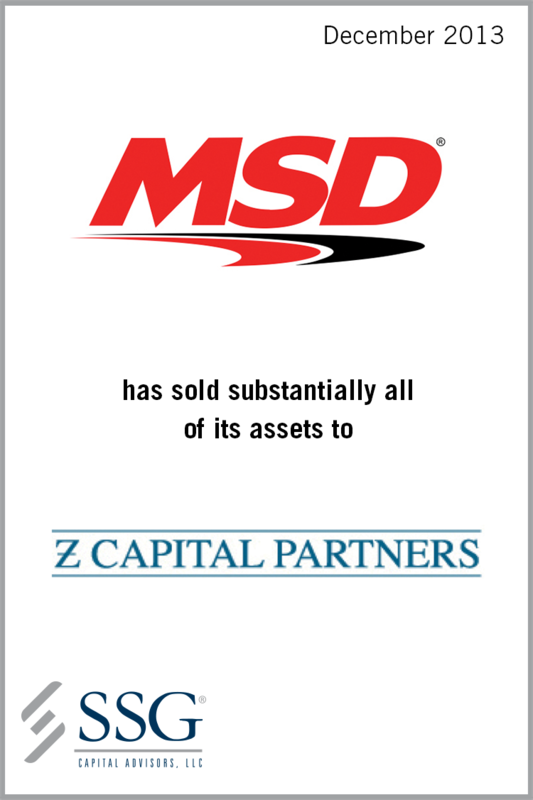 Z Capital’s offer of $78 million was ultimately the highest and best price for substantially all of the assets of MSDP. SSG’s experience identifying alternative solutions and its understanding of the Chapter 11 sales process enabled all key stakeholders to maximize the value of the assets while preserving the jobs of substantially all of MSDP’s employees.